Three people were killed and two others injured in a collision between a bus and a covered van on Rangpur-Bagura highway in Pirganj upazila of Rangpur on Tuesday. The deceased are - a covered van helper and two bus passengers. However, details about the deceased could not be known immediately. 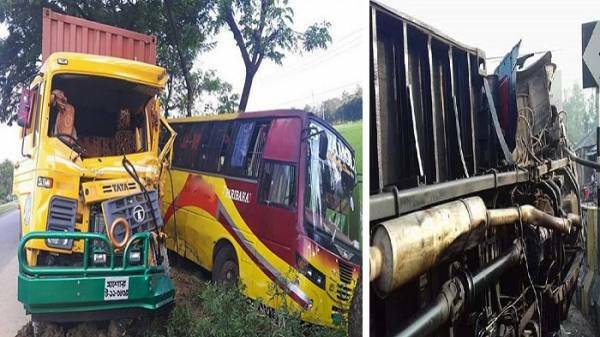 Swadesh Chandra, Officer-in-charge of Pirganj police station, said that a Rangpur-bound covered van hit a road divider and then fell on a Thakurgaon-bound bus around 4:00 am, leaving the trio dead on the spot. The injured were admitted at Pirganj Hospital.